Here is the panoramic view of Scientology complete. 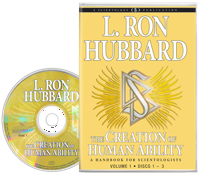 Having codified the subject of Scientology in The Creation of Human Ability, L. Ron Hubbard then delivered a series of half-hour lectures to specifically accompany a full study of the book. From the essentials that underlie the technology—The Axioms, Conditions of Existence and Considerations and Mechanics, to the processes of Intensive Procedure, including twelve lectures describing one-by-one the thetan exterior processes of Route 1—it’s all covered in full, providing a conceptual understanding of the science of knowledge and native state OT ability. Here then are the bedrock principles upon which everything in Scientology rests, including the embracive statement of the religion and its heritage—Scientology, Its General Background. Hence, this is the watershed lecture series on Scientology itself, and the axiomatic foundation for all future research. Phoenix, Arizona, 1954: L. Ron Hubbard had been researching, lecturing and group processing on a nearly continuous basis for the past year. The aim of this intense activity was the achievement of a goal as old as Man himself—the freeing of the human spirit. At the heart of that activity was a new training curriculum, Advanced Clinical Courses, providing profound insight into both the phenomena of the mind and spirit and the rationale of research and investigation. Groups of trained auditors enrolled for six-week periods of study and co-auditing, with personal instruction and lecturing by L. Ron Hubbard. And that training was relentless. In fact, over a nine-month period, he had delivered seven back-to-back ACCs comprising more than 450 lectures. In the wake of those words, L. Ron Hubbard next set out to render his hard-won discoveries into a concise yet comprehensive course of study every Scientologist could rapidly assimilate. In other words, he was about to present a panoramic view of Scientology, complete. With just that in mind, he assembled a standardized textbook, the Auditor’s Handbook, now known as The Creation of Human Ability—A Handbook for Scientologists. To accompany the book, in July 1954, he then delivered a series of half-hour lectures encapsulating the principles, practice and wisdom of Scientology. Through the months that followed, Mr. Hubbard added further lectures to round out this historic series. First, in August, he recorded four lectures embracing the Axioms. Second, in October, he provided an additional twelve lectures describing, one by one, each of the legendary thetan exterior processes of Route One. 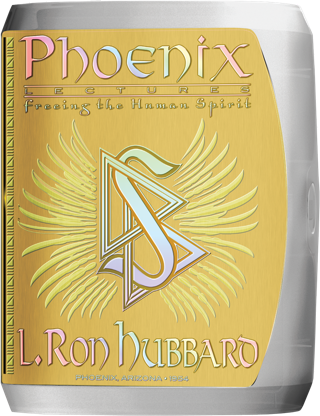 The final compilation of lectures, handpicked by Mr. Hubbard and broadly released to Scientologists as the Phoenix Professional Course Lectures, soon became renowned as the Phoenix Lectures. Here, then, is the Summary of Scientology, the very essence upon which the subject rests, the embracive statement of the religion and its heritage and hence, the embracive lecture series on Scientology itself. 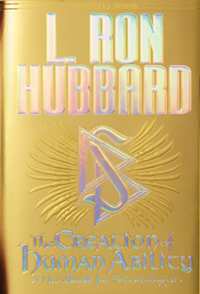 As definitive as they are immortal, these lectures stand as L. Ron Hubbard’s landmark overview of the Scientology religion, containing the fundamentals, axioms and truths which made possible, for the first time, freedom from the endless spiral of birth and death.